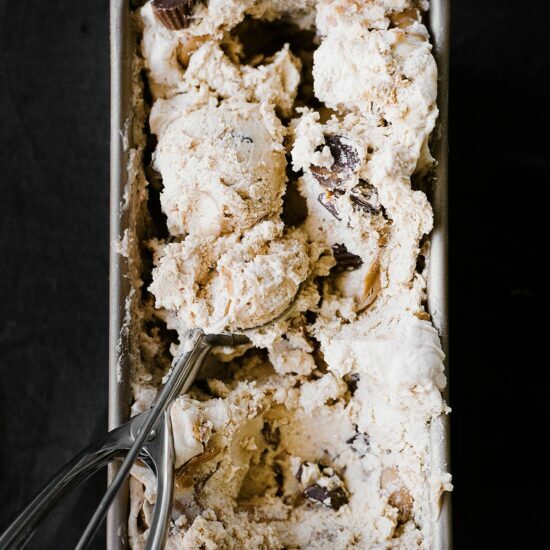 No Churn Peanut Butter Ice Cream requires just a few ingredients and a few minutes of prep for a rich creamy ice cream with tons of peanut butter flavor. Step-by-step video and FREE printable ice cream labels below! Taste: So much peanut butter flavor! It comes in three forms: peanut butter in the base of the ice cream, melted peanut butter swirled in, and mini peanut butter cups! Texture: Ultra rich, thick, and creamy. You don’t need much to be satisfied! Pros: Takes no time before you have homemade ice cream! Cons: This shortcut approach to ice cream is very rich, and there’s no good substitute I’ve tried for the sweetened condensed milk. Would I make this again? Absolutely! Jared loved this ice cream. If you know me at all then you know I’m a peanut butter FREAK. I eat the stuff every single day (no exaggeration). So obviously I love a tasty peanut butter dessert. I’m always finding ways to add in peanut butter wherever I can. However in this ice cream recipe, the PB is the absolute star. This No Churn Peanut Butter Ice Cream uses the 2-ingredient no-churn technique to make it as simple as possible (see my video on How to Make Ice Cream without a Machine here). In this technique we basically combine freshly whipped cream with condensed milk and peanut butter. Add in some vanilla, melted peanut butter swirls, and chopped mini peanut butter cups (buy the ones already out of the wrappers to make it quicker) and that’s about it! There’s a step by step video a little further below so you can see just what I mean. No eggs, no custard, no cooking, no churning. Once the mixture is made it just needs to freeze, preferably overnight. The peanut butter flavor actually intensifies as it chills. Though if you prefer a “soft serve” consistency you can enjoy it sooner. Homemade ice cream is a wonderful thing, but it’s a little awkward to find a container to store in the freezer that will keep a good seal it doesn’t get hard and icy. I absolutely LOVE my white pint size ice cream containers from Amazon. They’re basically blank Ben & Jerry’s containers! They’re stackable, come with lids that offer a nice seal, and make for perfect gifts when the weather is warm. FREE Printable Ice Cream Tags! 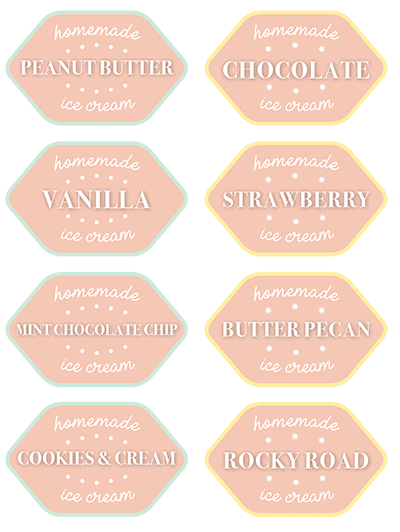 To complete your fun DIY ice cream project, I have two sheets of adorable printable ice cream tags. One page has popular flavors, and the other page is blank so you can fill in your own flavor creations. I like to print mine on plain full sheet sticker paper, then cut them out to fit my containers. If you give this recipe a go, be sure to upload a photo to Instagram and tag me and #handletheheat so we can all see! Note: The sweetened condensed milk should not be substituted in this recipe. In a large bowl combine the condensed milk and 1 cup of the peanut butter until smooth. 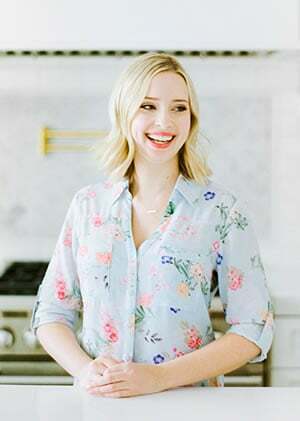 Place the remaining 1/2 cup peanut butter in a heatproof bowl and microwave in 30-second bursts, stirring between bursts, until melted and smooth. Set aside to cool slightly. In the bowl of an electric mixer fitted with the whisk attachment, beat the cream and vanilla on high speed until stiff peaks form. Fold the whipped cream into the peanut butter mixture until combined. Gently stir in the peanut butter cups. Layer the ice cream in a freezer-safe container with dollops and drizzles of the melted peanut butter. Once all of the ice cream and peanut butter is inside the container, use a knife to gently swirl the mixture. Cover the surface with plastic wrap before sealing the container. Freeze for at least 6 hours, or until firm and the flavor has ripened. Now THIS is an epic, high quality peanut butter cup ice cream. Always love your recipes, but this one especially grabbed my attention (love peanut butter-chocolate ice cream). It’s my birthday today, so I’m selfishly considering this post/recipe a celebratory one 😉 Thank you for sharing another awesome treat! I am going to stock my freezer with this! OMG can’t wait to try this! Video is not working……but love the idea of all that peanut butter! This ice cream was amazing. Such great peanut butter flavour and so easy to make. Is the chilling of the condensed milk necessary? I did a quick chill and noticed it was starting to change colour which I was unclear if that was normal. I think the next time I make it I might add a chocolate stripe into it too. I think it would be delicious too. It does help this to come together better. I’m not sure what you mean by change color? The condensed milk changed color as it was chilling? I did a quick chill in a water bath and when I opened the can the milk was more a golden brown colour than the normal pale neutral. I was unsure if I grabbed an old can or not so started again and pulled it out before any change might have happened. Do you normally just chill the condensed milk in the fridge overnight before using? I know you say not to substitute the sweetened condensed milk… but what about just regular condensed milk or half of each? I always use this no-churcn ice cream base… But mine is 2 cups of heavy whipping cream and 1/2 can (or less!) of sweetened condensed milk. Whatever I mix in the base, it will always be half the can or less, makes it less sweet which I and my family, even my friends prefer. I love to bake but i always cut the sugar in a recipe. Will try this soon coz I seriuosly love peanut butter and chocolate together..
Oh my! My scout and I just made up the mix. Will be hard to wait! Can I try this for business purposes ma’am tessa? I make a peanut butter ice cream but it needs to churn!! I have stopped making it now because it separates each time I make it!! I really don’t know why? Any ideas please? I am looking forward to trying your recipe.